Make Your Hen's Night Unique and Fun! 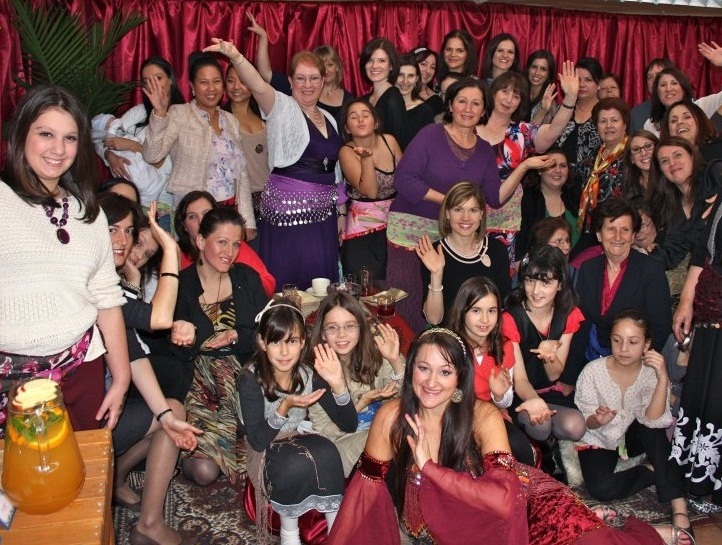 Belly Dancing Parties suited to women’s and girl’s gatherings such as Hen’s Night's, Girl’s Parties, Sweet Sixteen Parties, Kitchen Tea's & Bridal Showers within the Melbourne area. Have a belly dancer come to your venue or home and run a group belly dance workshop. We have a range of options depending on your budget & entertainment needs. - 45 minute dancing workshop, designed to be fun! Learn snake arms, hip drop, shimmy & more. (includes a beautiful belly dance coin belt). Imagine how thrilled your guests will be when you invite them to your Arabian Theme Party or surprise them on arrival with a Harem atmosphere at your home!! You may even just want to surprise the hen with a bellydancer and group workshop! It's a great party idea. For more ideas to complement your Belly Dance Party you could decorate your home like an Arabian harem with scented candles, incense, draped fabric and cushions to set the scene or hire a function room at a Middle Eastern or Moroccan Restaurant. Make your event a memorable one! Contact us now for a quote. The party can be held at the hostess’s house, a restaurant function room or other suitable venue. Party packages are priced at a fixed fee, so the price does NOT go up if you have more participants, we can cater for up to 50 people! Daytime and evening time slots available. Special prices are available for Dance Party Packages held on a Friday night or Sunday! Kaylah is also available for Hen’s Night belly dance parties in Geelong, Ballarat and other regional areas. It is suggested that bookings be made well in advance, especially for Saturday nights. 20 minute Bellygram for a Hen’s Party or Bridal Shower. Surprise the Hen with a bellydance show, message of congratulations, coin belt gift for the Hen and time for everyone to join in the dancing. Great if you have limited time, space or are in a shared restaurant. The ultimate entertainment package. 1 Hour bellydance lesson at the Hen's night and a beautiful 20 minute Classic Bellydance Show by a professional dancer to liven up your wedding and get people on the dance floor to create beautiful memories forever. Can you run the workshop at our home? Yes. The workshop can be done in most spaces, e.g. lounge room, family room, undercover garage or outside under a veranda if it's a nice day. There needs to be enough space for all the girls to stand up and be able to stretch their arms out. You can move furniture e.g. coffee tables to the side before the workshop starts. We require loud sound system that plays cds or mp3, if this is not available we will provide one. We are hiring a function room, will this be ok? Yes. The belly dancing lesson works better when you have a private area. That way everyone is more comfortable participating without other restaurant guests watching on! When you are booking the venue, please advise the venue you will be bringing a belly dancer. Most venues are delighted to help organise your special party. Ask the venue what the layout of the room is and check there will be space to run the dancing workshop. There needs to be enough space for all the girls to stand up and stretch their arms out. Some venues arrange the tables so that half the room has the dining tables and with a space for dancing on the other side. The dancer will bring music on a cd or media player to be played on the venue sound system. If your room does not have a sound system, the dancer will bring a portable system. We are in a restaurant, will this be ok? If you are in your own room that will be fine. If you are in a shared area of the restaurant, we recommend getting the 20 minute Bellygram. This includes a bellydance show, message of congratulations & a Gift Pack for the Hen to keep (including a beautiful bellydance coin belt). This is a good option if you have limited time or space. The tables do not need to be moved, as we work around the space provided. Please advise the restaurant in advance you will be bringing a bellydancer. Can you travel outside of Melbourne? Yes. We are happy to travel to you wherever you are! We will add a travel fee according to the additional driving time and this will be included in your quote. I’m not sure I could do all of those moves, I’m pretty uncoordinated! The workshop is designed to be fun and is inclusive so that everyone can participate regardless of ability, fitness, age or shape. It is an introductory bellydance lesson where you learn moves such as snake arms, hip circle, shimmy & more. Some of our most popular workshops are with all ages including everyone from young children through the Hens Grandmother joining in! Anyone can try bellydancing! How is the Bollywood Fusion Package Different? The Bollywood Fusion package takes inspiration from current Bollywood music clips. Catchy Indian Bollywood music is used and a short Bollywood choreography is taught. What do we wear? Do we have to show our belly? You will stay in your regular clothes that you wear to the party. We will bring along a scarf for you to tie around your hips. Bare bellies don’t need to be shown, unless you want to. What about the Hens / Birthday Girls costume? We bring along a gorgeous belly dance costume for the Hen / Birthday girl to dress up in at the party. There are covered up and daring costume options for her to choose from. We show her the costumes at the party and she can choose if she would like to wear a costume. After you have booked, we will ask you about the Hen / Birthday Girls approximate dress size. We have kids costumes as well as small, medium and large adult costumes. The price varies depending on the day and how far we have to travel to get to your venue. As a guide, a 1 hour party for any number of guests on a Saturday night within 30mins drive of Melbourne CBD will cost $350. We offer a small discount for parties held on Friday and Sunday. It is best to book as soon as you can, especially for Saturday afternoons & evenings. Generally speaking, if you book 2 - 3 months before the party you will be most likely get your preferred time slot. If the party is soon, get in contact with us as we may be able to work out a suitable time. Need more ideas, inspiration or help with organising an upcoming Hens Night? Download the FREE guide "How To Host a Fabulous Hen's Night". This expert guide, written by party planning extraordinaire Fiona Amarasinghe of Easy Breezy Parties, provides you with practical advice on everything from selecting the venue, communication with guests, budgeting, through to games to play on the night and more, to help ensure your Hens Night runs smoothly and is enjoyable for everyone. With over a decade of experience as a professional belly dancer and having organised hundreds of Hen's Parties, Fiona's guide can help you save time and money while giving the Hen a party she will love. Thanks for a great session on Saturday Kaylah - all the girls loved it - especially the bride. Hi Kaylah, I just wanted to say thank you for Sunday. Everyone absolutely loved it!! Looking for some unique entertainment for your Hen's Night Party, Bridal Shower or Kitchen Tea? Need Hens Party ideas? Short on time to plan Hens party games or want to avoid the embarrassment of a stripper? Need a great hens night on a budget? Try a BELLY DANCING PARTY!!! Let us organise an hour of laughs and fun for you and all your guests. It is a great way to start an afternoon or evening and a fun way for guests to get to know each other. 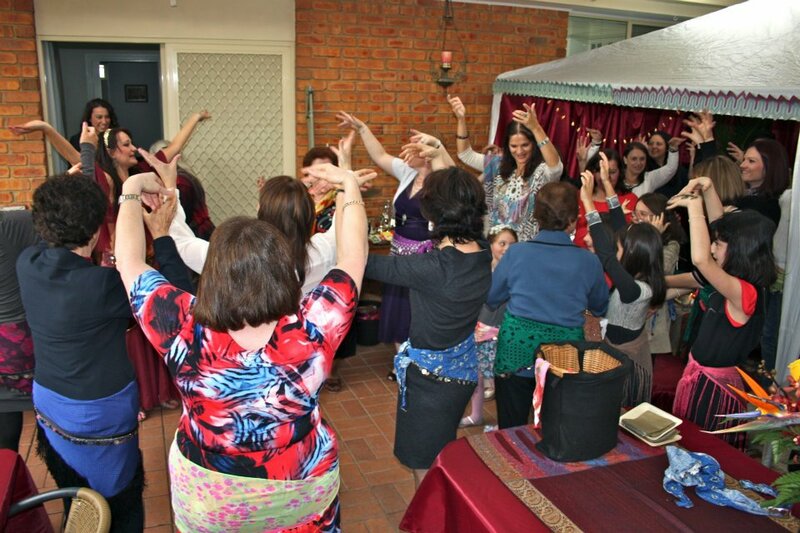 Belly Dancing Group Lessons in Melbourne & surrounding areas.